Postdoctoral fellow and filmmaker Ian Mauro expected to gather knowledge from Inuit elders about climate change that would help empower their indigenous voice in current policy debates. 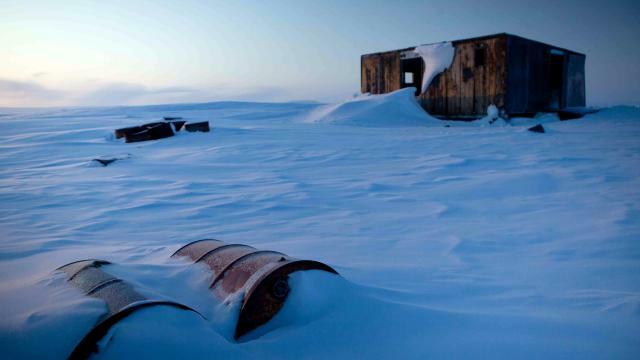 What he didn't expect was to uncover new scientific evidence of a warming climate. In a unique, SSHRC-supported, community-based multimedia project, the University of Victoria researcher in environmental studies teamed up with colleagues Peter Kulchyski and Chris Trott from the University of Manitoba and internationally acclaimed Inuk filmmaker Zacharias Kunuk (Atanarjuat The Fast Runner) to record interviews with Inuit elders using digital video, filmmaking and Internet tools. After interviewing 55 elders, hunters and women, four experts, and Canada's Governor General, the results were greater than anticipated. "Do you want to know the most mind-blowing thing I've heard?" asks Mauro. "Inuit elders from four northern settlements separated by thousands of kilometres have independently concluded that climate change is caused by the earth having tilted on its axis." 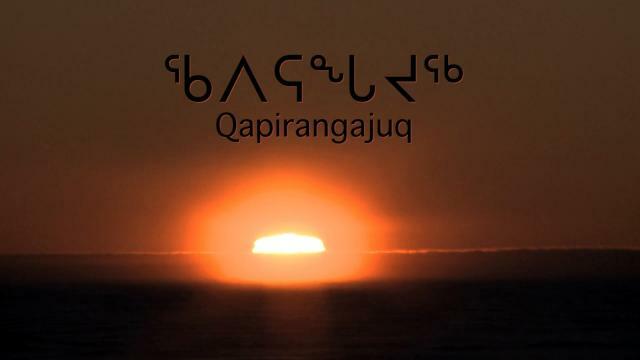 Mauro says elders from Nunavut in Resolute Bay, Iqaluit, Igloolik and Pangnirtung all noticed the stars, moon and sun have shifted in their positions. The sun is now rising higher, staying longer and is warmer than it used to be. When Mauro first heard of these observations in 2009, he went to the scientific literature to see if anything had been published to support the elders' claims. He found very little. "Trusting the knowledge of elders, we shared their perspectives with scientists," says Mauro. "By linking different ways of knowing, we discovered that a warming atmosphere is actually changing the refraction index of the sky, which dramatically alters the visual landscape of the Arctic." 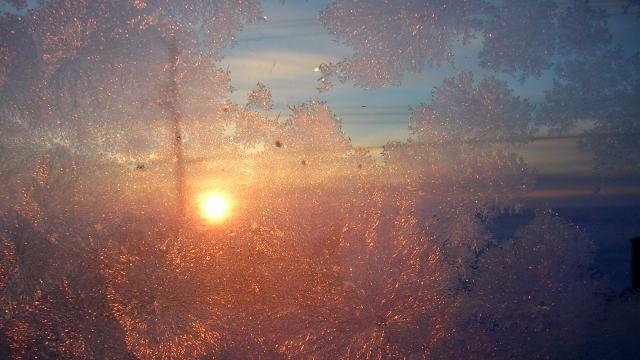 The phenomenon is caused by low altitude refraction. According to Mauro, the only other researcher actively working on this topic is Wayne Davidson, a meteorological observer in Resolute Bay, who first documented similar observations in the 1990s. "Understandably, the elders attribute the visual change to a tilting earth, but it's actually an optical shift caused by a complex interplay between the wind, atmosphere, earth and ice," says Mauro. "This observational knowledge of objects shifting in the sky is actually proof of a warming world." 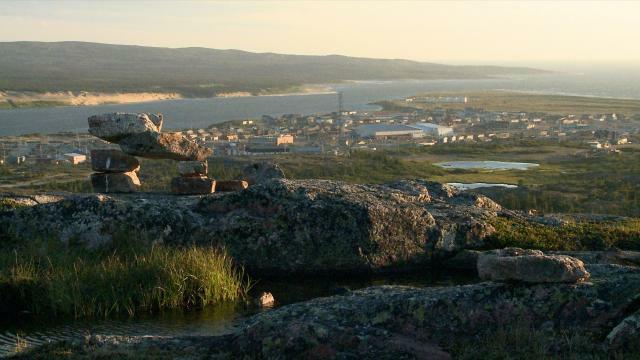 Surprisingly, Inuit are not particularly apprehensive about climate change, says Mauro. Instead, they are prepared to ride the wave of adaptation. He says the message from the communities is that humans and animals can adapt to changing ice conditions, global ocean currents and altered migratory patterns. Having thrived for more than 4,000 years in the Arctic through multiple warming and cooling cycles, Inuit have no doubt about their ability to adjust. Mauro and Kunuk are working on a feature-length research film, to be released in 2010, about Inuit knowledge of climate change. Already, their work has garnered significant attention from climate change experts and political leaders; a portion of their work was screened in December 2009 at COP-15, the international UN climate change conference in Copenhagen. The news media has taken note as well. CBC's The National aired a segment in December about the team's unique approach to gathering Inuit knowledge. 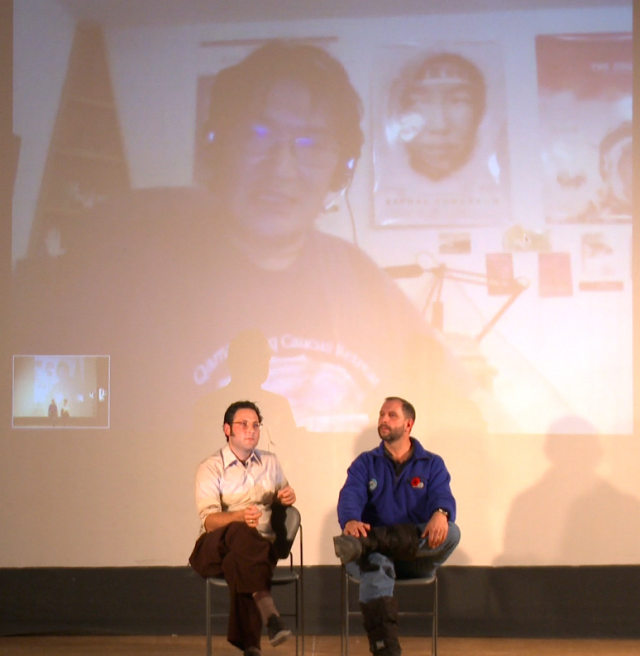 Integral to the project is the IsumaTV website, which chronicles the team's progress, and hosts blogs and video footage of all interviews: Inuit Knowledge and Climate Change. 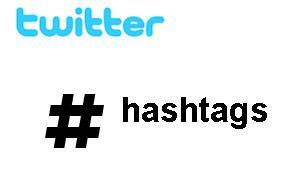 The site is receiving tens of thousands of hits per month. Mauro says the project is pushing digital research and filmmaking to a new level with respect to capturing oral history and telling the Inuit story. He speaks of the "democratization of research" through his and Kunuk's approach to collecting and disseminating Inuit knowledge. 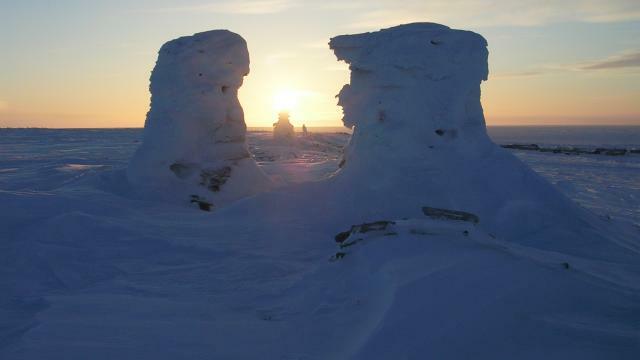 Importantly, Kunuk carried out the interviews with Inuit knowledge-holders, which allowed elders to tell their own stories in the Inuktitut language. "Oral history is fundamentally embedded in the personal history of the observer," says Mauro. "We edit the video, of course, but at its core it belongs to the storyteller. In that sense it inverts how academia does research." Mauro believes that engaging Inuit communities must be done with respect for their culture, language and complicated history with southerners. "Inuit knowledge enriches what scientists are saying and it also provides a ray of hope that humans can adapt, come what may," says Mauro. "In many ways, it provides a pathway toward sustainability." 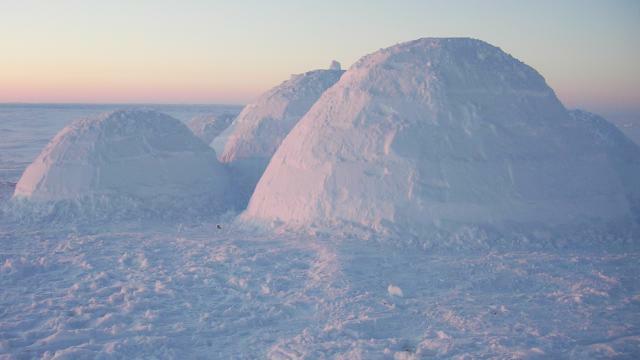 Inuit Knowledge and Climate Change is having its US premieres in Washington DC (March 28th) and New York (March 31st) in association with The Smithsonian Institution. Anticipating these events, co-director Ian Mauro was interviewed by EcoCentric Blog about the film and the impact it is having on public and expert opinion. Siila Watt-Cloutier's keynote lecture on climate change, human rights and indigenous communities now available. Siila Watt-Cloutier's recent keynote lecture on climate change, human rights and indigenous communities is now available. 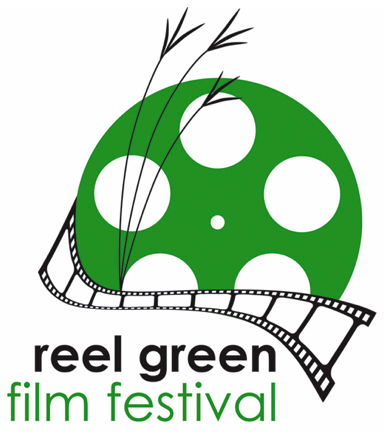 Inuit Knowledge and Climate Change screened last weekend in Winnipeg at the "Reel Green Film Festival". Follow this link to view the online article dated February 4th. 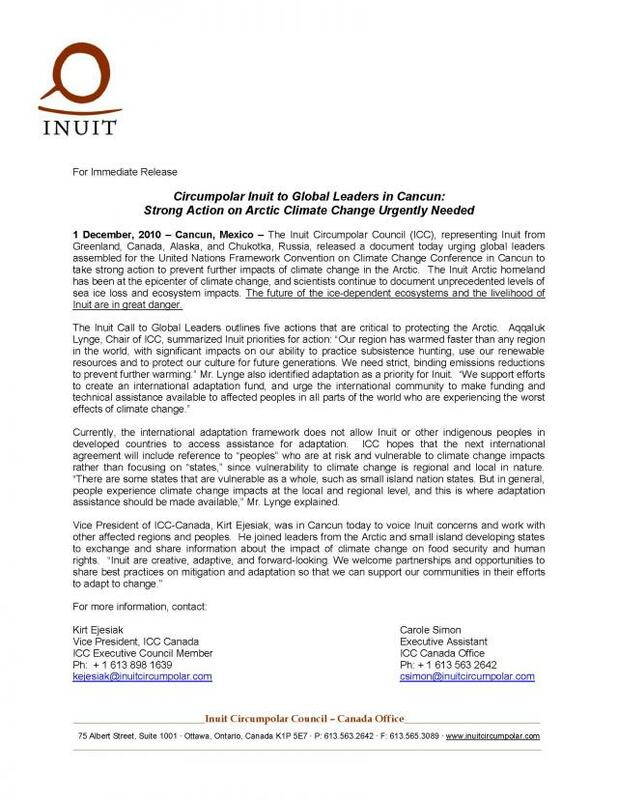 "Filmed with the visual grace typical of Igloolik Isuma’s previous films, Qapirangajuq presents elders talking about climate change"
This statement was released by Inuit leaders at the UN's COP-16 international climate change meetings in Cancun. Please download to read. "Inuit Knowledge and Climate Change" will be screened nationally and internationally over the next month. On December 5th, the film will be presented at the international UN COP-16 climate change meetings, and will be followed by discussion with partner organizations, including The Council of Canadians, The Indigenous Environmental Network, and others. 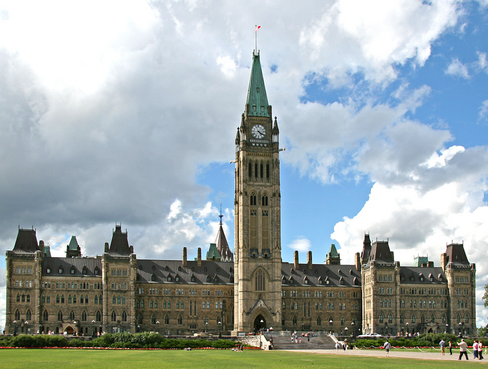 On November 24th, Inuit Knowledge and Climate Change was screened on Parliament Hill at The National Press Gallery, the audience included approximately 40 MPs, Senators and Government Staffers from across all the major Canadian political parties. 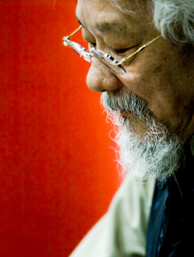 David Suzuki and his foundation have been strong supporters of the "Inuit Knowledge and Climate Change" project. 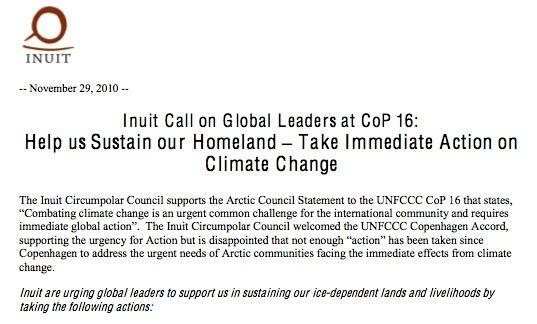 Back to Inuit Knowledge and Climate Change. 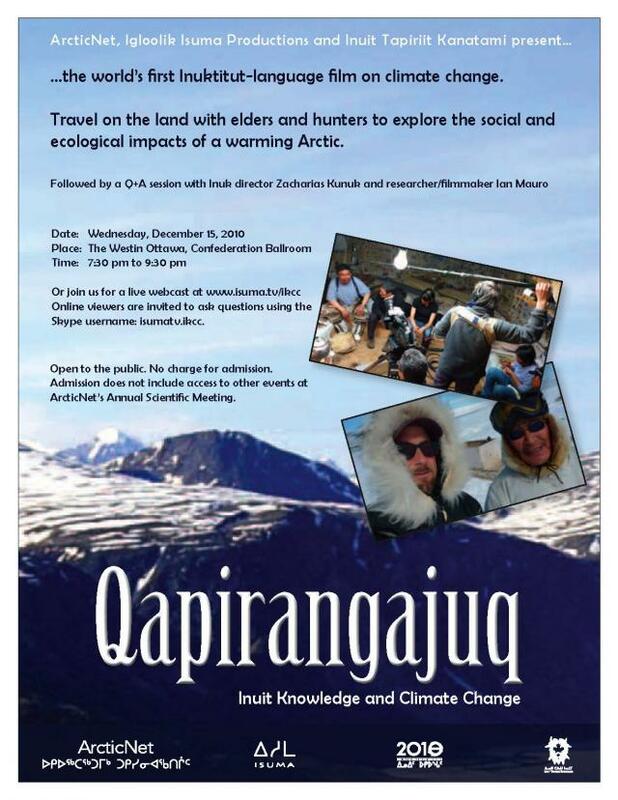 Inuit Knowledge and Climate Change was screened in the northern community of Churchill, Manitoba, on November 5th, 2010. This was our second public screening of the film.